In the constantly evolving world of manufacturing, mold and die shops must continually improve productivity without sacrificing part quality. As you strive to stay competitive, you may need to work smarter and harder… With harder materials, that is. Many molds and dies require these hard materials to operate optimally. For example, H13 steel is capable of getting hot while not losing their temper or getting brittle, S7 steel is great for dies because it is more resistant to impact, and stainless steel usually makes an appearance in medical applications. Additionally, many molds will use multiple types of steel in the same tool. To illustrate, if you have a tall boss that might tend to get hot and wear prematurely, moldmakers might use a material like H13 as an insert portion of the mold because it will hold up better than standard steel. If you use the same material in the whole mold and that feature wears out, that die or mold is no longer usable. When qualities that help improve a material’s performance generally hurt its machinability–often the case with hard materials–how should you proceed and still maintain productivity and quality? For many manufacturers, machining hard materials seems like trying to finely carve marble with a sledgehammer–nearly impossible. The biggest difference when machining normal moldmaking materials versus much harder steels and metals is the processing that occurs. In other words, applying the right tools and the right strategy at the right stage in the manufacturing process is an art that you can and should master. You’ll first need the correct tools in order to machine hard materials. Typically, machinists must choose from three tools–ball end, bull nose, and square end mills–and probably combine them for different stages of the manufacturing process. First, the ball end mill typically serves well for roughing operations, in addition to many finishing operations. A ball end mill has a large radius. This helps dissipate heat and force, enabling high speeds and feeds so you can cut closer to the net shape. Then, on parts with large, flat floors, you might consider using a bull nose tool. However, due to its smaller radius and poor capabilities for dissipating heat and force, this tool is not ideal as it often leads to chipping. If the part requires sharp corners where the floor and wall meet, it might call for a square end mill. Dry machining with air, or occasionally oil, is often used, as well, as chips are usually smaller and spindle speeds are higher. As finishing tools wear, they can sometimes be demoted to semi-finishing tools. Some shops will sharpen and re-sharpen old tools, which leading to a need to compensate with CAM programming for the varying cutting edges of a tool. For instance, a ¼-inch tool might be used during a cutting process and then gets sharpened–the sharpening process actually removes material from the cutter–you might be left with an obscure tool geometry, like 0.235 inches. Programming then needs to reflect that new cutter to perform operations properly. For crucial features in a mold or die, moldmakers often make a gauge to check those individual features. Those gauges are commonly rolled into the price of the molds and kept under lock-and-key. Moldmakers typically use these gauges once they’ve gone into production with the mold as well–using it as a spot check for the mold as it wears. Programming templates are used quite often in the industry as well. For instance, if you’re developing a CAM program with a gibs feature, you could bring up your gibs template so you don’t have to choose all new tools and tool paths. Instead, you can use proven tools and toolpaths and even patterns for that specific feature. Templates like these are also often used for speeds and feeds on specific features, giving you the ability to pick a feature and a tool, then have the speeds and feeds already provided. This templating process is often used on the standardized features of a mold–things like gibs, base plates, ejector plates, retainer plates, etc. These templates become most valuable when dealing with hard materials because of the time value and tool wear. Knowing proven patterns and tools when working with hard materials is valuable because they help make the cutting process faster and more efficient, and ideally, more profitable. Typically, you’d begin roughing hard materials in their annealed, softer state (before they’ve been heat treated). 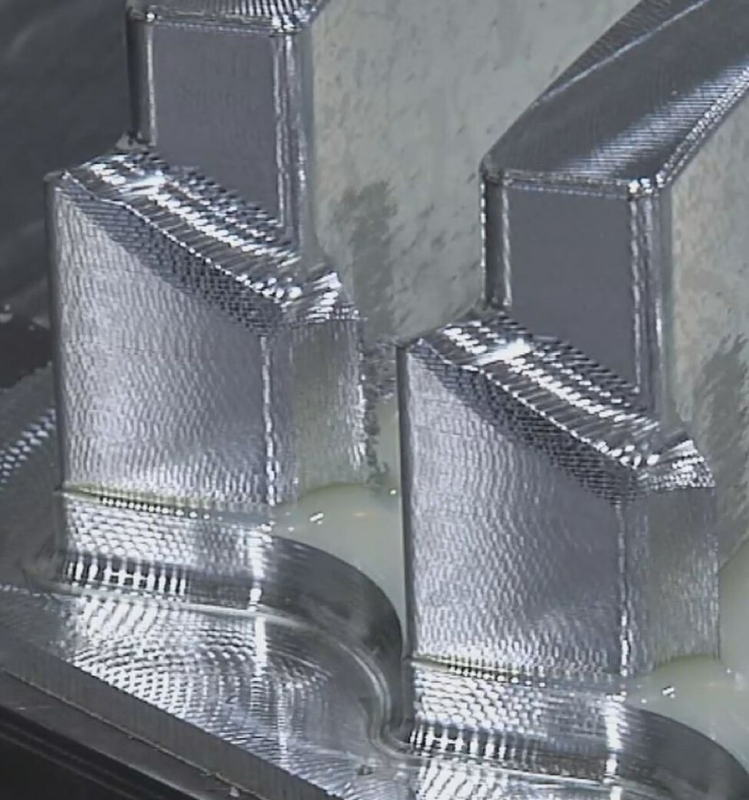 This kind of soft machining enables easier removal of material and helps relieve some of the stresses within the mold or die. Receiving these materials in the annealed condition makes machining much easier than after they have been heat treated. Since you’re roughing at this point, using inserted cutters are a great choice because they can really make the chips fly. During this roughing process, before heat treating, you’re looking for optimal material removal, so tool path patterns that move fast and throw a lot of chips are ideal. Toolpath concepts like adaptive clearing are designed for exactly these types of situations. When heat treating a mold it’s best to leave 10 to 15 thousandths of an inch as part of a semi-finish process. When heat treating a mold it will often twist and warp. While this twisting isn’t drastic–sometimes difficult to see with the naked eye–it affects how a mold fits and functions. Leaving some stock provides an opportunity to adjust the mold for twisting during the finishing process. If you fail to make adjustments for twisting, you may end up with unwanted tool marks or even obscure features from the roughing process on your final mold. There’s a balancing act. Leave too much stock before the heat treating process occurs, then be left with a more significant area to finish. That’s time consuming both because there is more material to deal with in finishing, but also because now it calls for hard machining. Roughing annealed metal before other processes can help relieve some of the stresses within the mold or die. However, finishing operations typically happen after the heat-treating process, requiring a hard machining strategy. 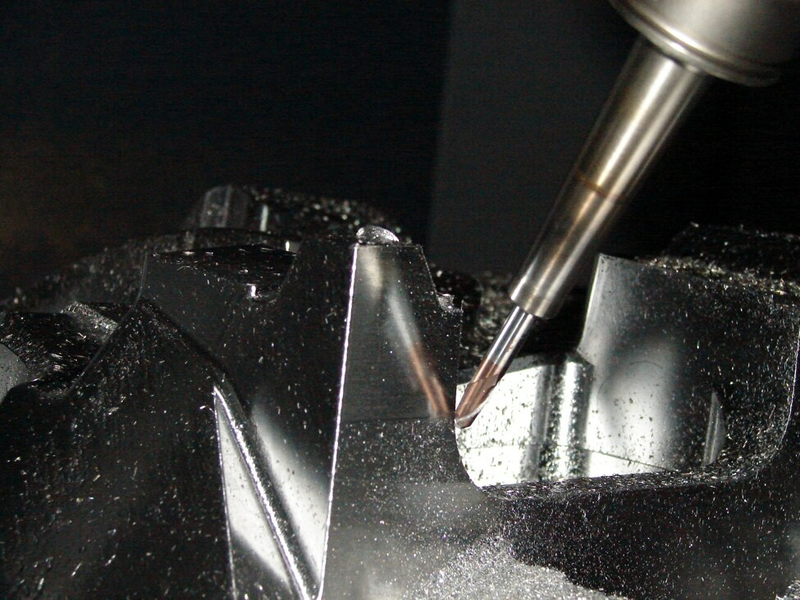 Machining hardened materials creates a different type of chip than other metals. Hardened materials may ultimately be stronger, but are generally more brittle and difficult to machine. 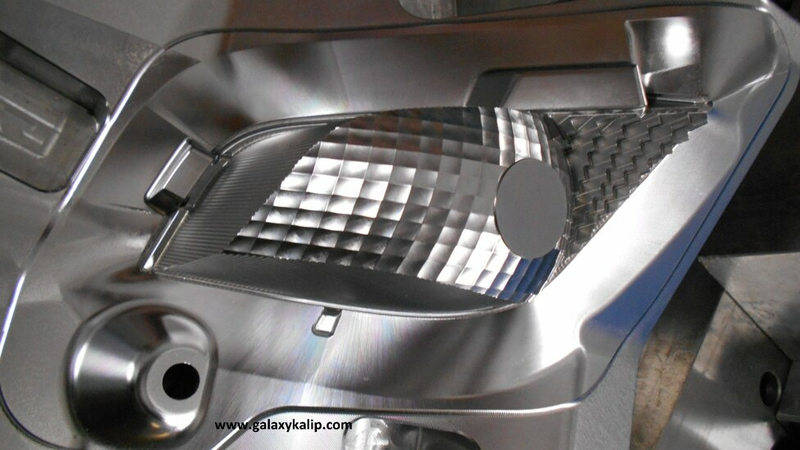 Finishing operations then call for careful stepovers since a specific surface finish is required. Techniques like raster passes–which makes the cutter intersect with vertical parallel planes that were created during the roughing process–are often used to get the high-quality, precise surface finishes needed. Now dealing with a combination of hardened material and a finishing process, using a variety of tooling operations proves the best way to get the desired surface finish. Finally, the key to machining hard materials, like many things in the world of machining, comes down to tooling and toolpath choices. Almost any machine that can handle steel can handle hard materials, but the proper machinist and proper CAM choices is the only way to succeed.